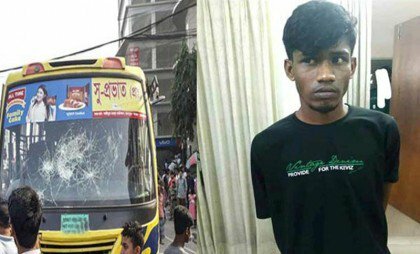 A Dhaka court has placed the driver of Suprobhat Paribahan that crushed Bangladesh University of Professionals student Abrar Ahmed Chowdhury to death, on a seven-day remand. Dhaka metropolitan magistrate Debdas Chandra Adhikari passed the order as today after Officer-in-Charge (OC) of Gulshan Police Station Aminul Islam produced the driver before the court and pleaded for a 10-day remand. Abrar, son of Brig Gen (retd) Arif Ahmed Chowdhury, died after being run over by a ‘Suprovat Paribahan’ bus in front of the Bashundhara gate around 7:15 am on Tuesday. The driver, Sirajul Islam, 24, was driving the bus with the license of light vehicles.